FORECAST: Warm week ahead with some showers Late Week. Rain chances are spotty today but increasing tonight. Thursday: A shower or two. A possible t-storm in the afternoon. (30%) Breezy Wind: SW 15-20 mph. Mild. . High: 78°. Thursday Night (AWARE): Scattered showers and some thunder will be more likely (60%) Windy at times. Low: 59°. Clouds will increase across the region through the early morning along with a light southerly wind will keep it mild with most areas in the mid 50s to low 60s. 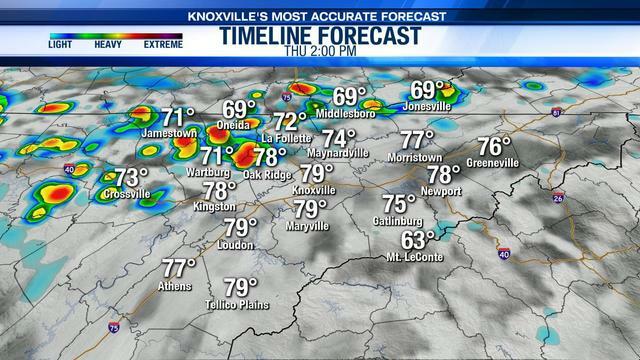 It will remain mostly cloudy, breezy and warm on Thursday with highs right back into the mid-upper 70s and by late day/evening, a few stray storms could pop-up across the Plateau up into portions of S.E. Kentucky. We will be Weather AWARE late Thursday night through at least midday Friday as a cold front sweeps across the region. Scattered showers and some storms will increase in coverage, but again, the severe threat looks low. These showers and storms could certainly impact the morning commute Friday and have an impact on early morning outdoor plans. 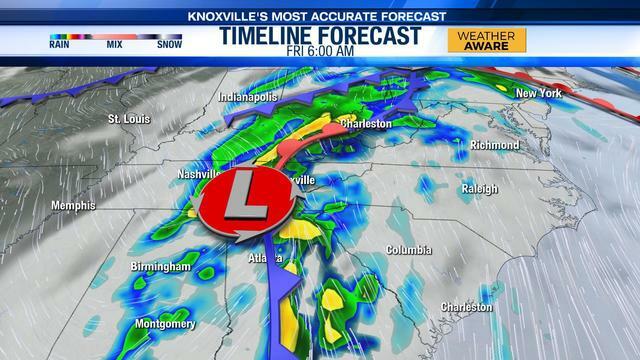 The front looks to clear the Mountains around midday Friday and we will slowly see some clearing from west to east during the afternoon and evening hours. Brisk northwest winds will kick in as well bringing in some cooler air. Most will only see highs in the mid-upper 60s Friday afternoon and fall off into the 40s under a clear sky Friday night with a few spots in the upper 30s. We will start Saturday cool and sunny clouds will return through the afternoon with highs remaining mid 60s. to mid 70s. Rain chances look very low late Saturday into early Sunday, but again there will still be more clouds than sun around to start our Sunday. The clouds thin some by later in the day and highs once again will reach the mid 70s. Temperatures will climb back to and beyond the 80 degree mark early in the work week with limited rain opportunities through mid week.